I've read that a tenet of good reviewing is that within the first few sentences the writer will get across the key essentials of what he wants to say and all else is a evidential elaboration. 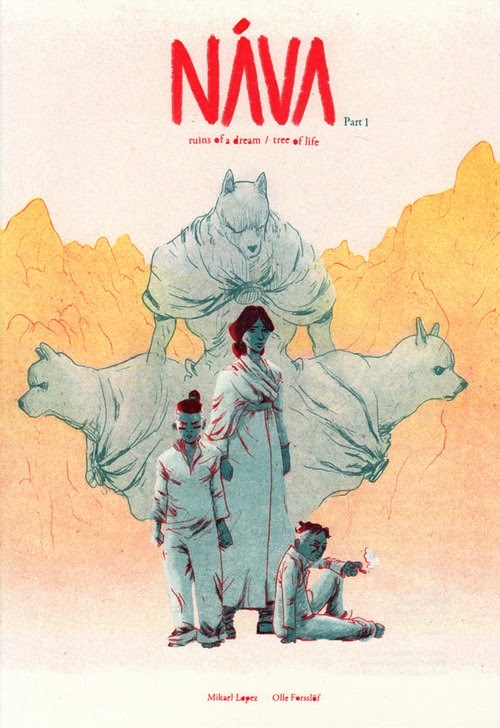 So here you go: Náva is one of the most impressive comics I have read this year, and certainly one of the most striking and beautiful. It combines mythological, loric elements and stunning, minimal vistas for a story-telling experience that moves through several beats; a pared-back cinematic opening, a transient, dream-like encounter before transforming into an adventure story complete with a city of children enslaved by wolf-headed masters. It begins with a temple located in the middle of a vast desert; a structure with clean, geometrical architectural design that invokes both sci-fi imagery and Incan/Egyptian influences, at once alien and familiar. Inside the temple, a huge statue of a woman sat in cross-legged repose cracks and then breaks, releasing her apparent flesh and blood likeness from within. While the reason for her imprisonment is unclear (forgotten deity? transgressive priestess? ), the woman is seemingly many things- spirit, human, guide, champion, protector, and thus freed, she at once travels to bargain with the Allmother for another chance to complete whatever she initially set out to do. It's so difficult to pick one segment of this book as superior, but the choices and execution here, in the women's altercation with the Allmother cow, are simply gorgeous. 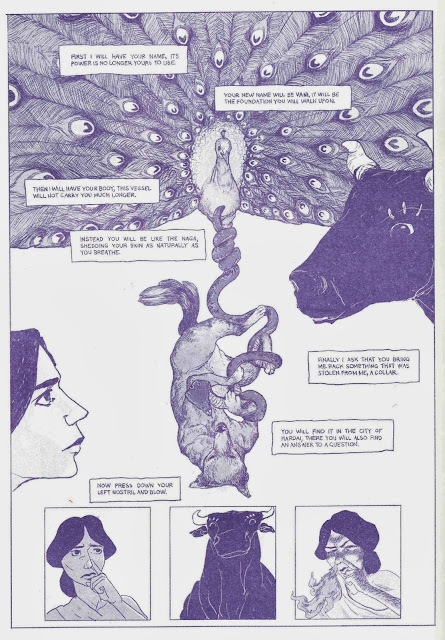 Náva is risograph printed in jewel tones of teal and purple; the teal colour is used throughout the story, while the purple only makes an appearance in this section, indicating the metaphysical plane on which they are now communicating as the women's purple spirit leaves behind her teal body, and a rich bulk of ink fills the bovine stature, lending it a peculiar majesty. The change in colour underlines other events of significance, too- the woman is bestowed a name (inferring power) and appointed the task which will grant her redemption. At this point, much is still unclear- who exactly the woman is, what she wants- not so that you feel lost, but intrigued and invested. The woman travels on foot, for days, or months, or years, until she reaches the mountainous borders of the city she wishes to enter. Here, she comes upon a boy and his mute sister working on what is, above ground, a great dead tree. Underground, in place of roots, exists a perfect binary reflection of the plant- a hanging lush, green healthy tree exuding a strange, thick sappy fluid with numerous remarkable properties, the children's job which it is to harness and bottle. 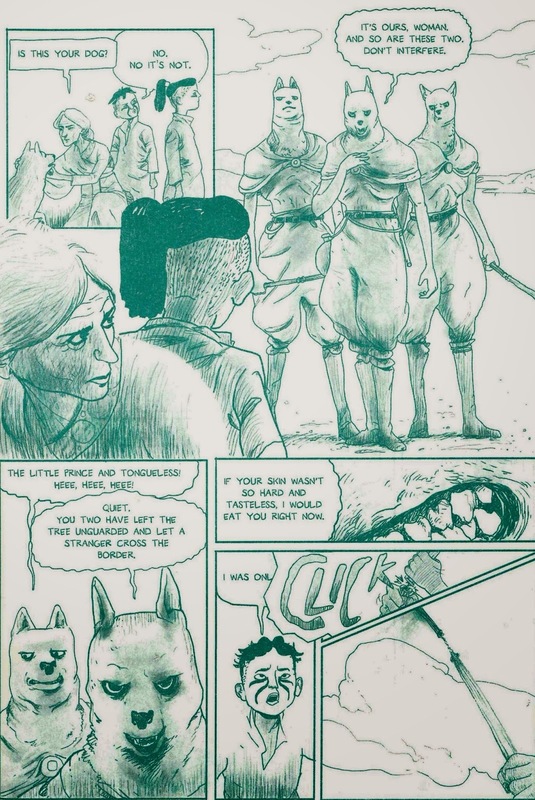 Even as the woman is learning the tale of how the girl lost her tongue, of a city full of child slaves, of cruel, feral-looking, wolf masters, they are discovered and a fate decided for them. It's near impossible to create brand new ideas, and what Lopez and Forsslöf have done so successfully is take a multitude of prevalent, identifiable iconography from myth, religion and literature, and combined these with a hybrid of genre facets to produce a great, fresh comic. If you've ever seen a film where the hero traverses a hot desert, where a temple crumbles into the sand, where quests are set, Náva invokes those feelings and experiences when reading, adding and building to your base of recognition and pleasure. In many ways it felt like Leo's Aldebaran on an alternate scale. 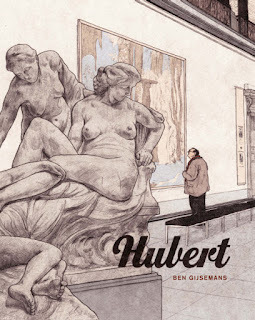 Writing and art work together in comics, but it would be incredibly remiss not to mention Olle Forsslöf's illustration of this book, because I can't see it having the same tone or impact if done by anyone else. I believe I already mentioned how attractive a comic this is, from those first 10 stunning, silent pages to the transient, dreamscape of spiritual communing and verbal parrying, to the burst into more traditional adventure fare- he manages it all with deft capability. 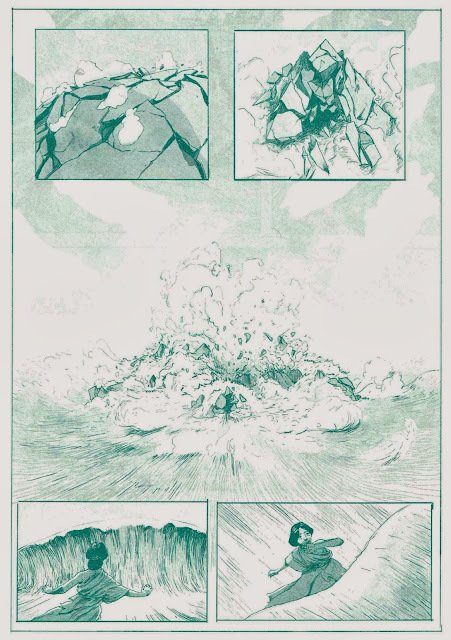 Forsslöf's style is a slew of fine and finer lines, minimalist shading and hatching to desired effect- simply put, his art is just quite stupidly beautiful, particularly when rendering sparseness to epic standards. If gods and talking cows and spiritual panes all sound a bit like airy fairy tosh to you, you should pick Náva up anyway because a) it's not pretentious as my description may imply, and b) it has the hallmarks of something truly a little special and is honestly just that good. This issue is a hugely promising beginning of a larger story, one that I sincerely hope Lopez and Forsslöf get to continue telling until completion. If you're curious, you can read the first 15 pages of Nava here (this preview version is not coloured as in the print copy), and at 31 pages long, that's half the book. If I could urge you to buy even one comic on my recommendation it would be this one.